1. 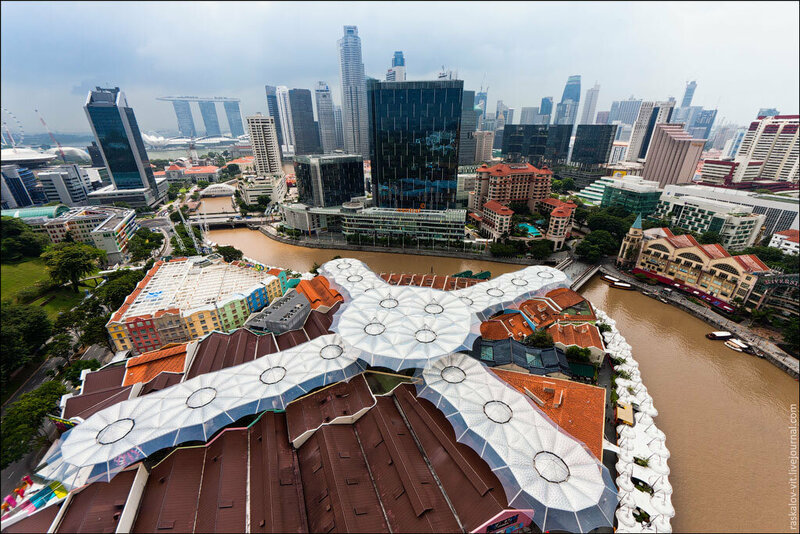 The first and the coolest roof in the whole Singapore. 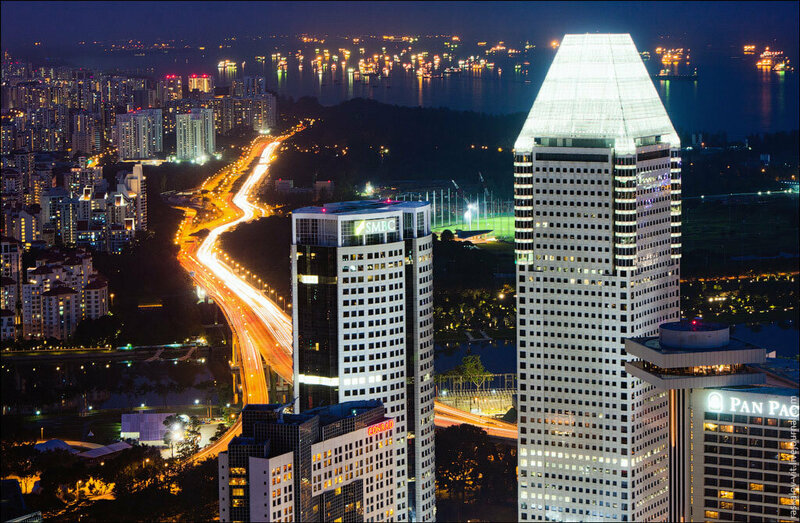 This 226 meters high building is Stamford Hotel. 2. 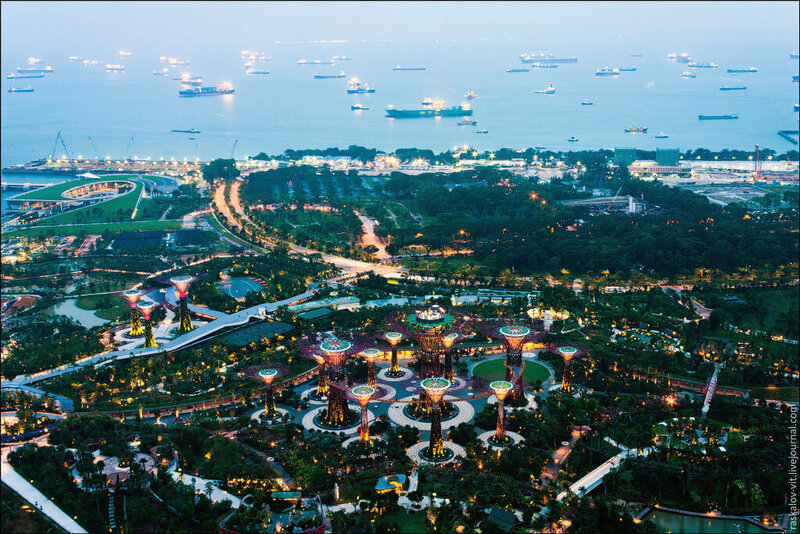 From here you can see a stunning view of the whole Singapore. 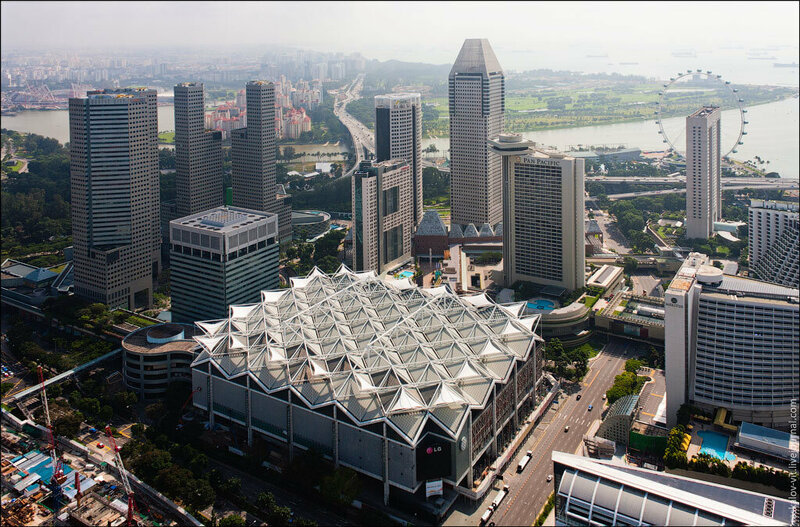 Esplanade – Theatre and Marina Bay Hotel. 5. 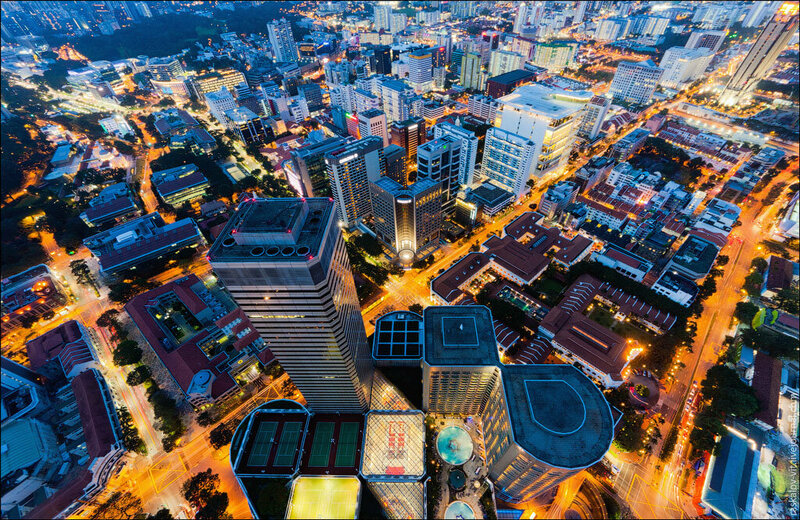 View down from the roof of one of the tallest buildings in Singapore.Interesting fact is that I entered the roofs illegally and I didn’t even think of any consequences, however I wasn’t caught. 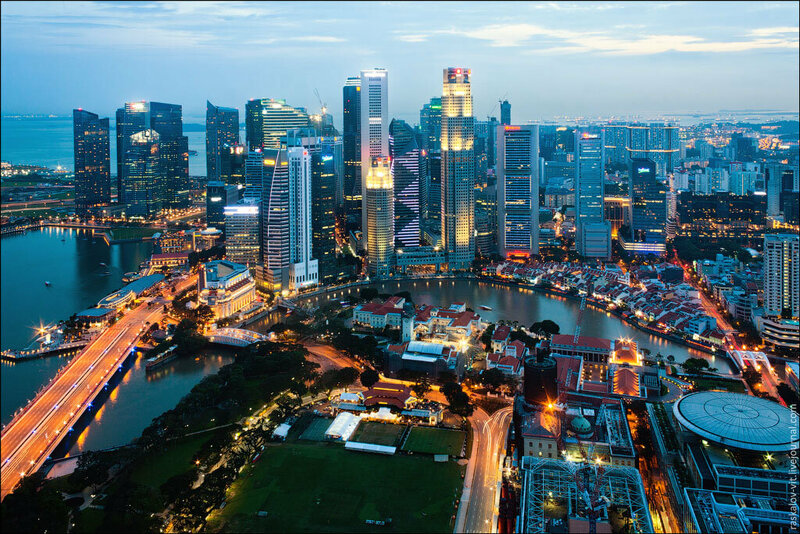 I spent 4 days in Singapore, two of them just walking around the city because on the second day I read about the strictness of Singapore laws. As it turned out you can easily spend up to 1 year in prison for breaking a lock and additionally you can be beaten with sticks. 6. 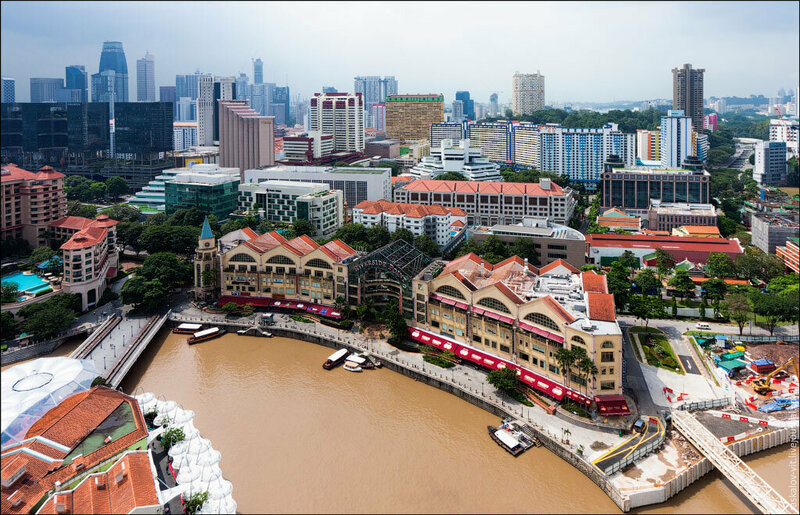 Boat Quay and Clarke Quay along the embankment – Busy districts of restaurants and places for people to walk. 7. 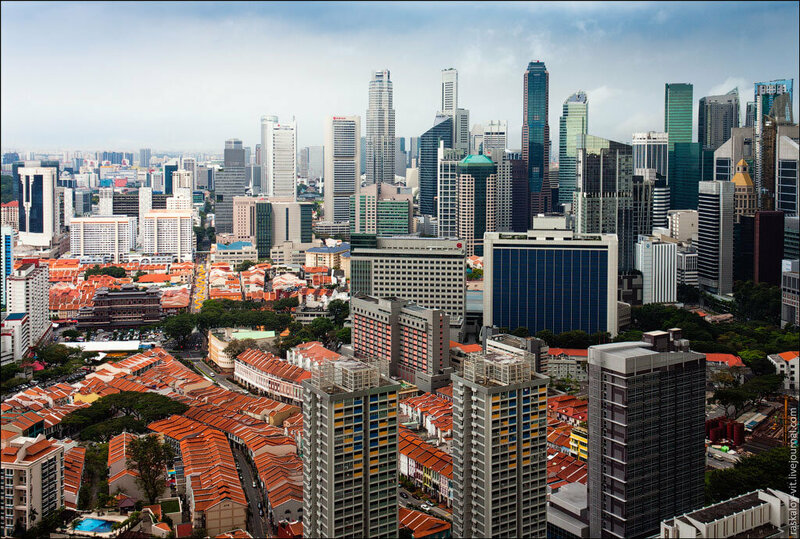 This is the beginning of Singapore bedroom communities. 8. Everyone asks me why water is so dirty, but I don’t know the answer. 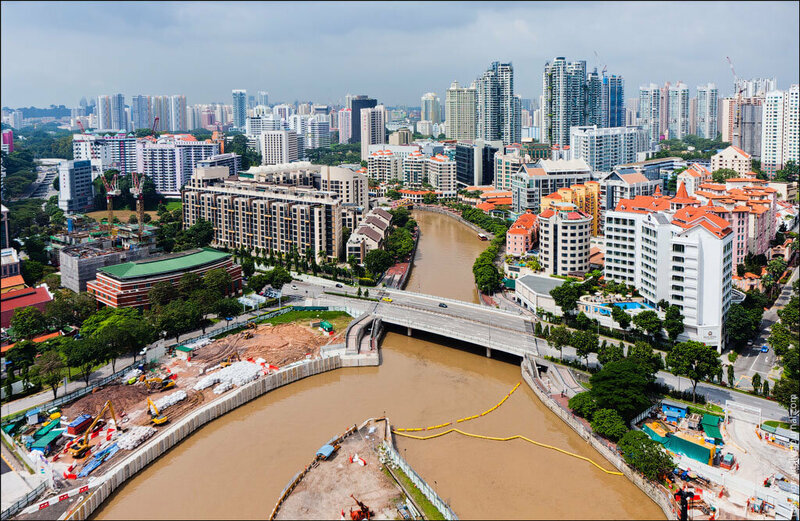 Experts on of Singapore, can you explain why the river in such a clean city is so polluted? 9. 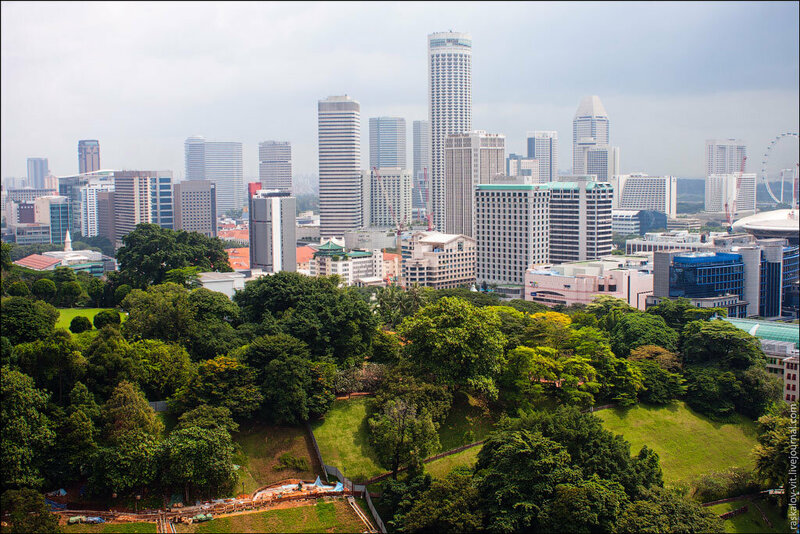 Despite the high concentration of skyscrapers, the city is very green. There are parks and trees everywhere. The photo shows the Hotel Stamford, with the roof from which I just went down. 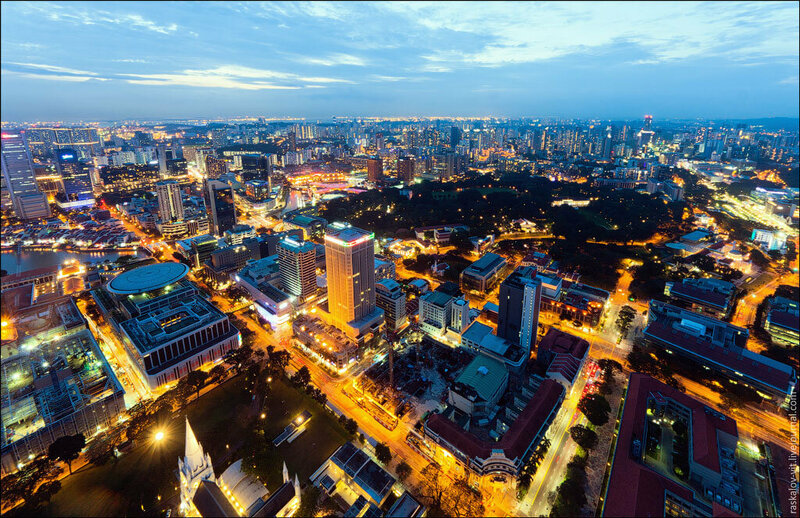 The City. 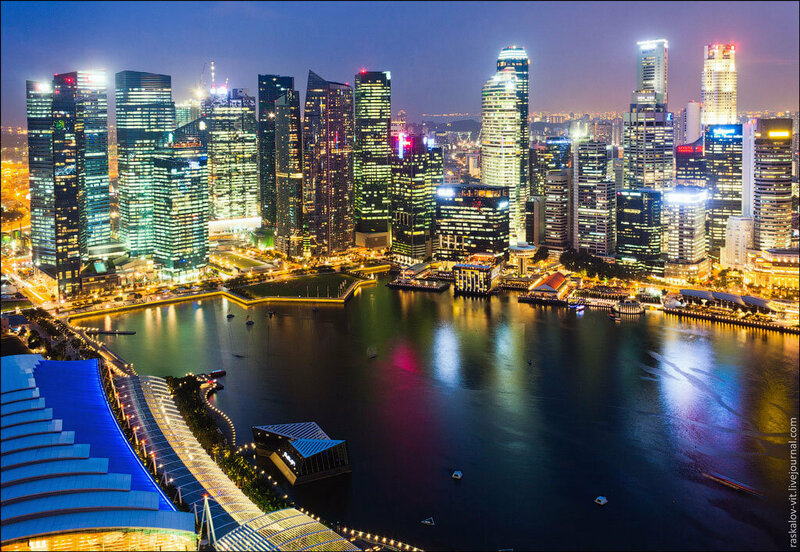 Singapore is in the top ten countries with the lowest level of corruption, and ranks first in the same rating of Asian countries. 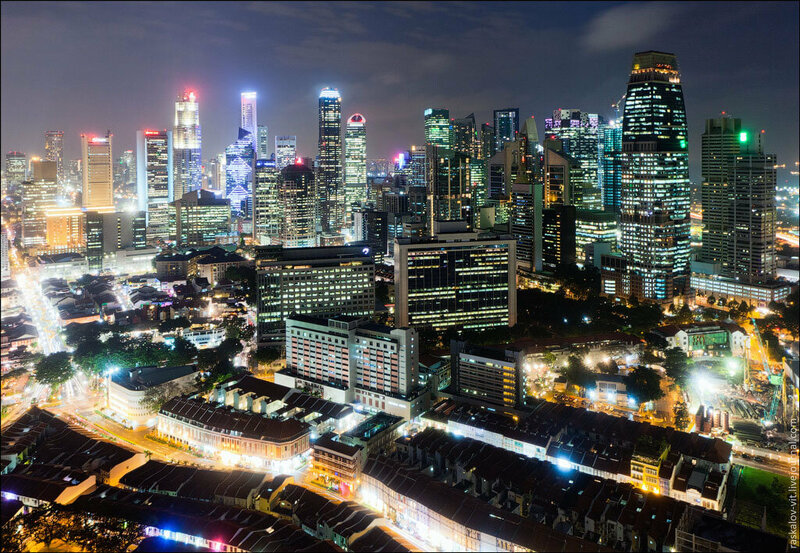 Local mafia (“the Triad”) was severely suppressed, the crime rate is extremely low, and the standard of living is one of the best in Asia – GDP per capita is over $ 28,000 (in China – $ 7,800, in Russia – $ 8,600). 10. 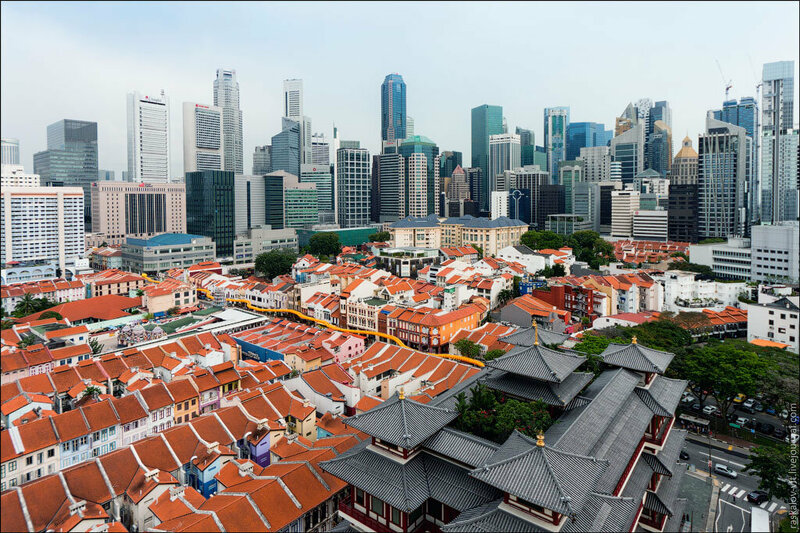 Chinatown and the Temple of the Sacred Buddha’s Tooth. In the temple there are sacred remains of Buddha’s tooth in a magnificent sacred stupa composed of 420 kg. gold donated by the faithful. 12. 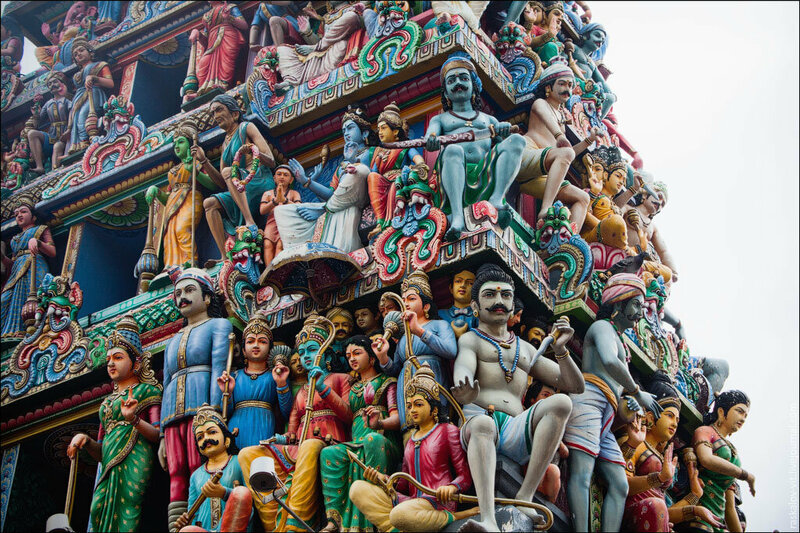 Sri Mariamman Hindu temple. 13. 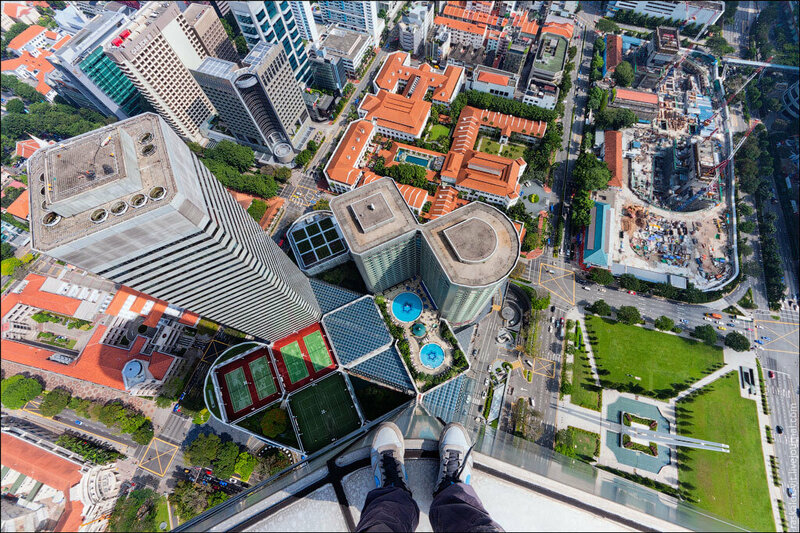 I climbed on one of the roofs in the business quarter of Singapore. In general from here you can’t see anything, except a huge number of skyscrapers that surround you from all sides. 15. 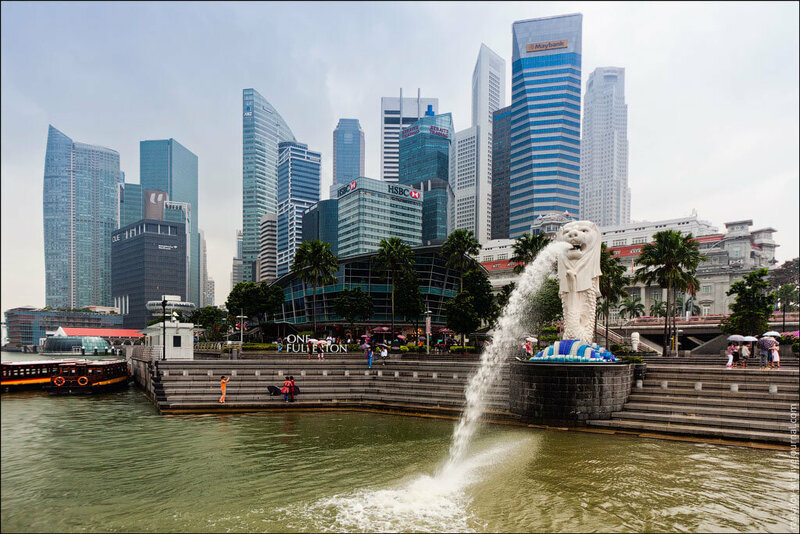 The Merlion is a national personification of Singapore. It is a mythical creature with the head of a lion and the body of a fish. 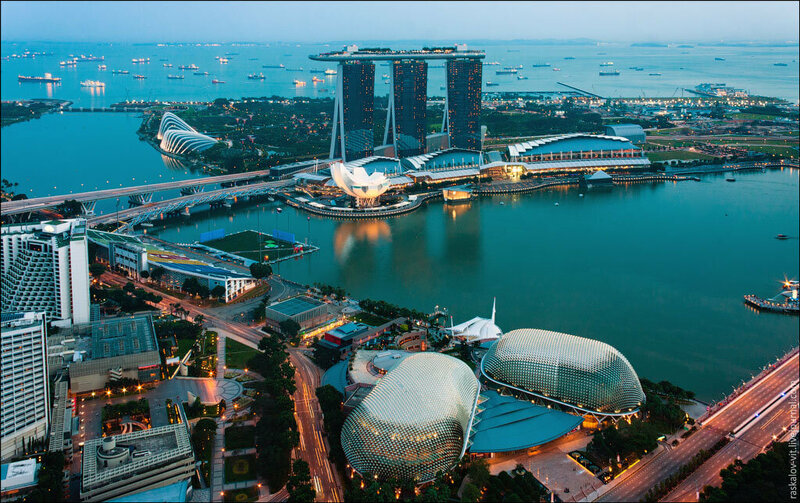 The head of a lion symbolizes strength and courage, while the body of a fish underlines Singapore close relationship with the sea. 16. 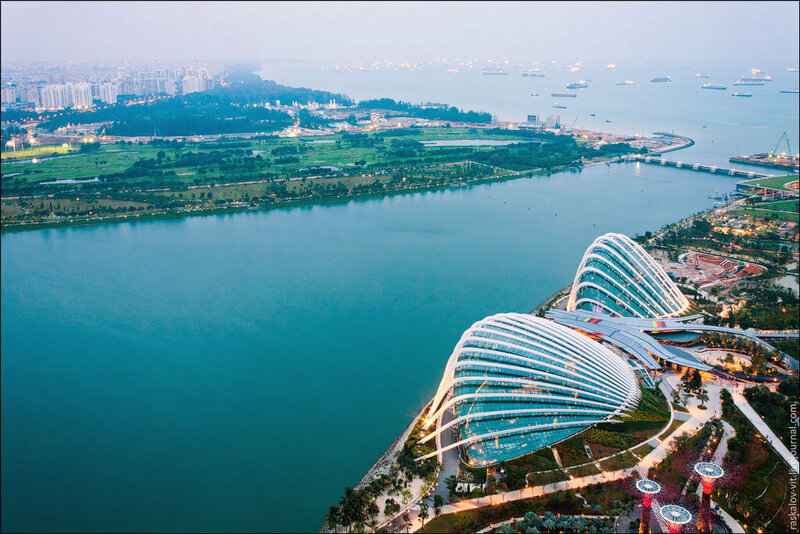 Marina Bay,Esplanade bridge and Museum of Art and Science. 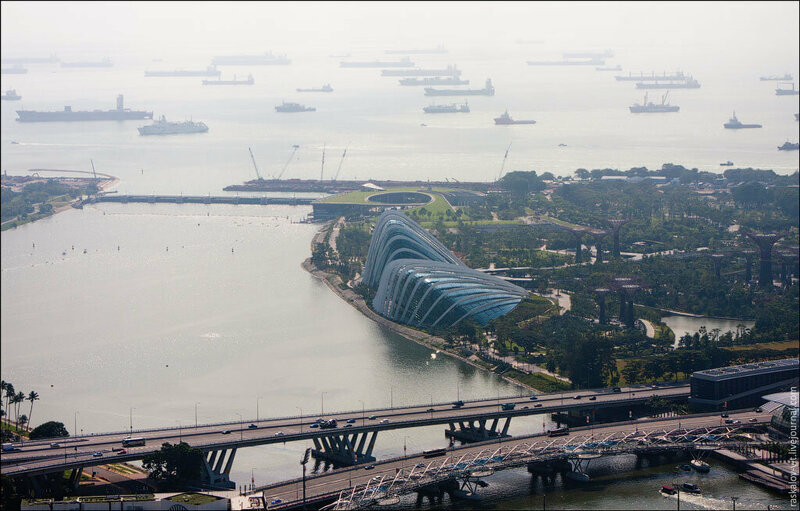 The building is a lotus shaped, it has an area of about 4,600 square meters, designed by the architect Moshe Safdie. The roof of the museum is unique. It is designed to send rain water like a waterfall through the atrium of the building. 17. 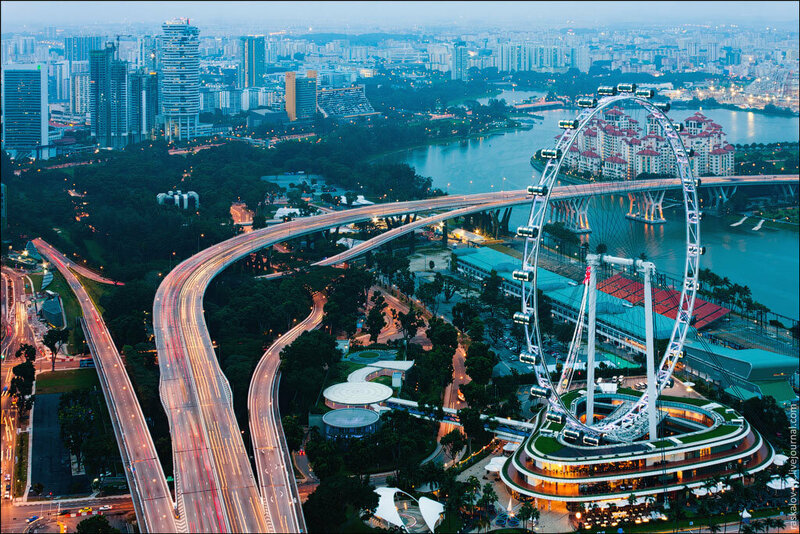 Singapore Flyer – a giant Ferris wheel situated in Singapore, constructed in 2005-2008. 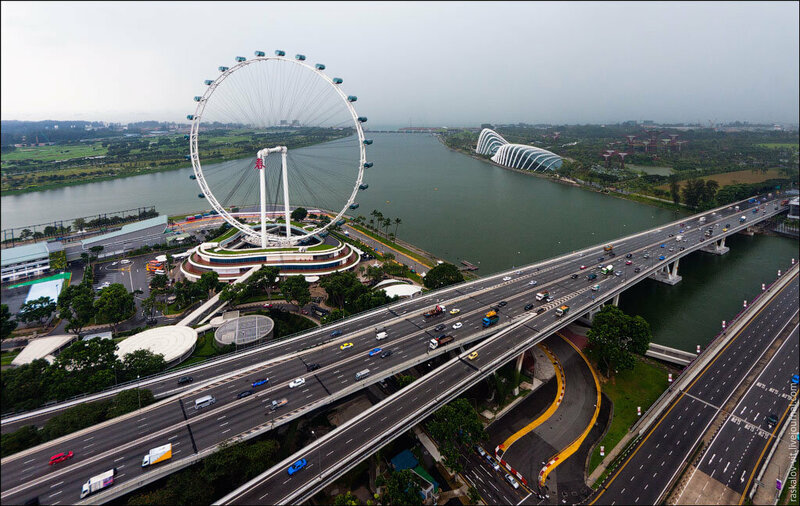 It reaches a height of 55-storey building, with a total height of 165 meters, that makes it the tallest Ferris wheel in the world. 18. Very cool roof with a huge garden, sun loungers and realplayground. Entrance is free for people living in this house and for others it costs 10 Singapore dollars. 19. The house is divided into 4 sections, and all these sections are connected by a huge terrace on the roof. This place is worth going at least for the roof. 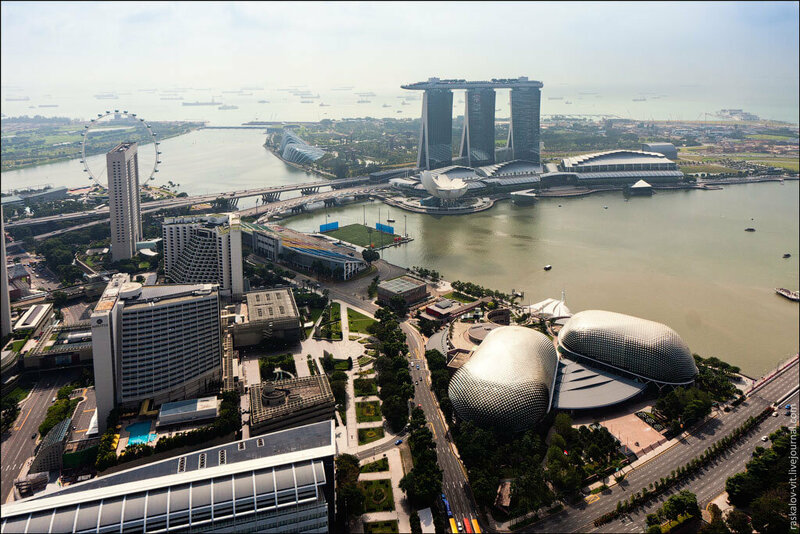 Views here are also very good, but for example views from Marina Bay or Stamford hotels are quite better. 20. 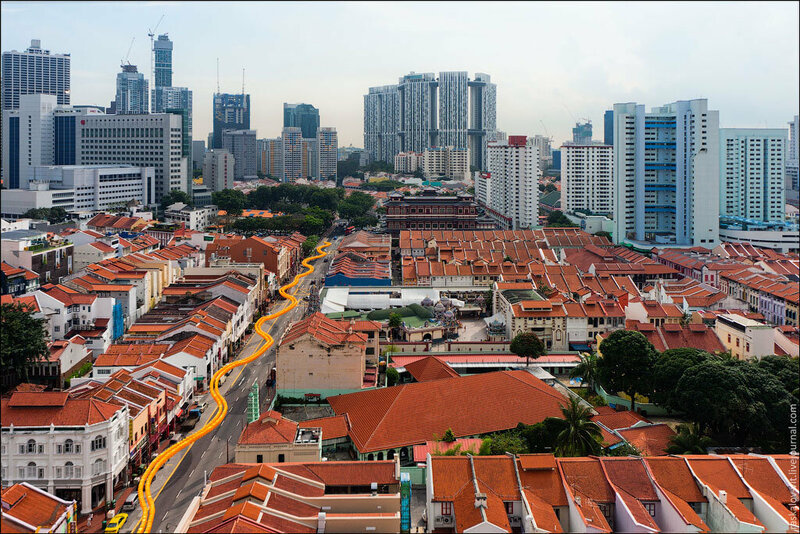 Contrasts of Singapore. 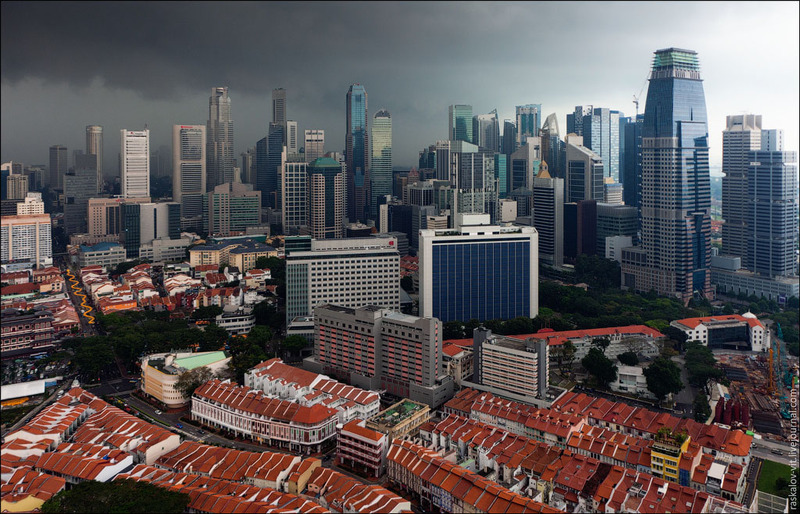 Weather in Singapore is unique, there’s always 30 ºC and it rains several times a day. It’s not an ordinary rain. It’s a heavy downpour with thunder, which lasts for 5-10 minutes and then it’s sunny again. The sight is awesome. For example, in Moscow, a similar weather can be seen no more than twice a year. 21. We are back on the roof of Stamford Hotel. 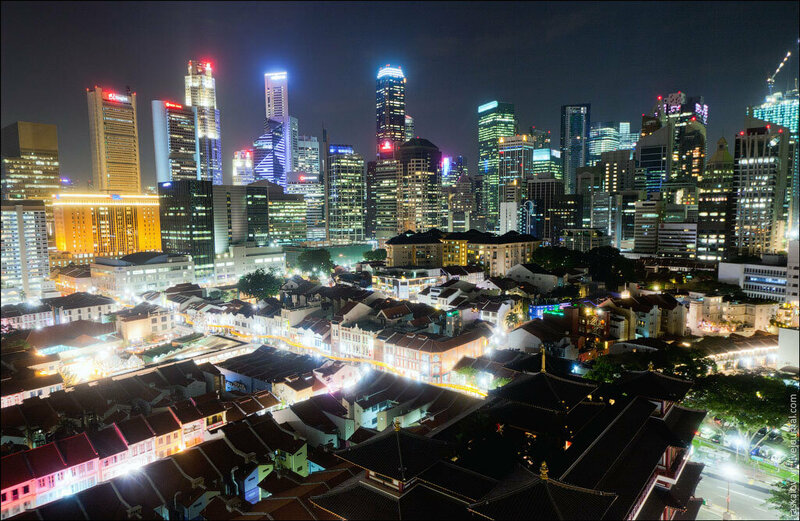 Night view of Singapore business quarter. 26. 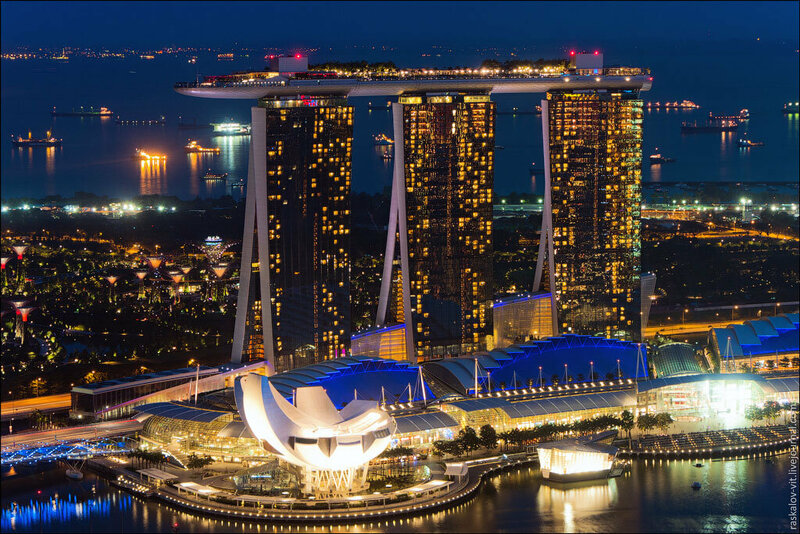 Marina Bay Sands – is considered one of the most unusual hotels in the world. Huge terrace in a shape of gondola with pools and lush green gardens with total area of 12.4 thousand square meters is located on three 200 meters high towers (55 floors). The main pool is located in the open air and has no visible edges, so it appears that the edge of the water falls from the top. The pool is 150 meters long and is the largest swimming pool, built on such height. 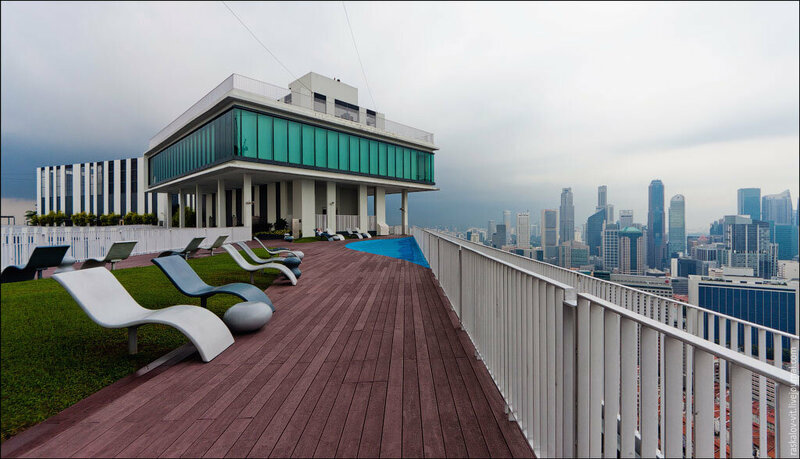 Many tourists go to Singapore just to visit this hotel, and they are right. It deserves to be one of the main sights of this city-state. 27. Night version of the orangery Cloud Forest. 29. 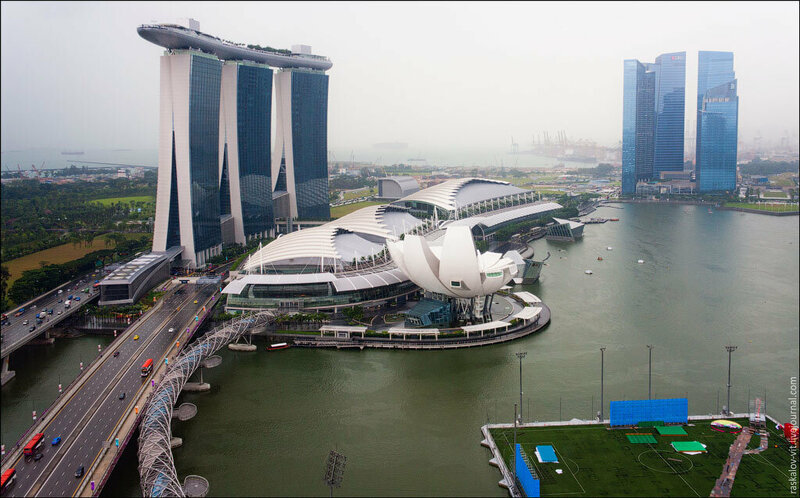 I moved to the roof of the famous Marina Bay Hotel, unfortunately I did not get to the swimming pool, but it was very easy to get to the observation deck for free and save $ 20. 30. 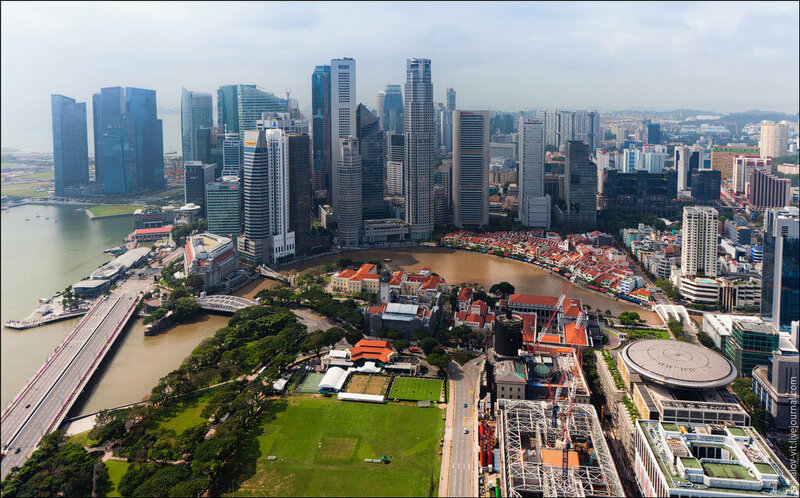 From here you can see the best panorama of the Marina Bay Formula 1 Street Circuit. Singapore Grand Prix is a unique stage of “F-1” for several reasons. Firstly, it runs at the street circuit, and secondly, it is the fastest. 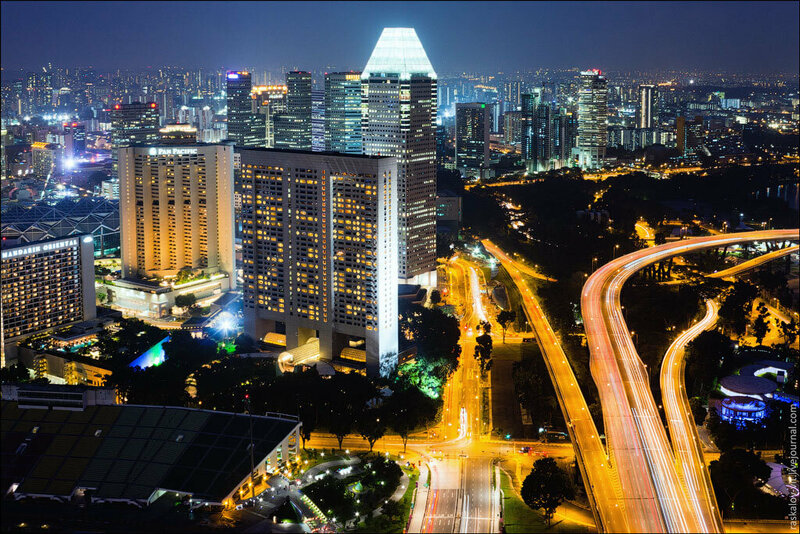 Singapore Grand Prix has been held since 2008. 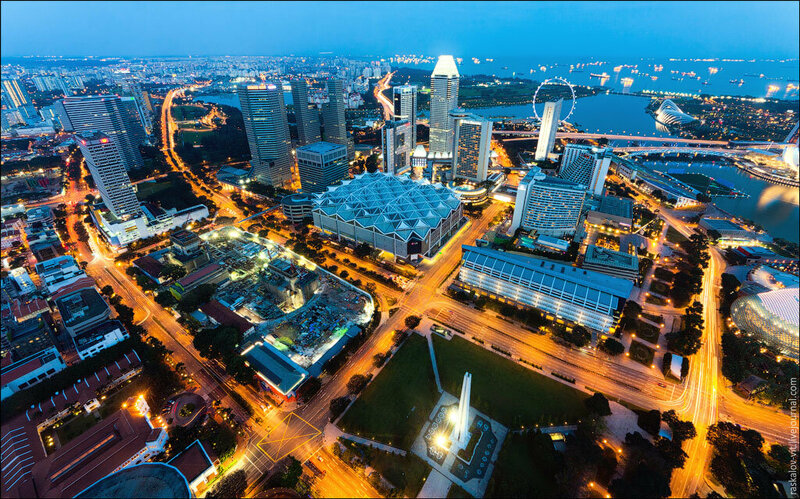 And the main thing is that only at the Singapore Grand Prix drivers compete at night under floodlights. 34. 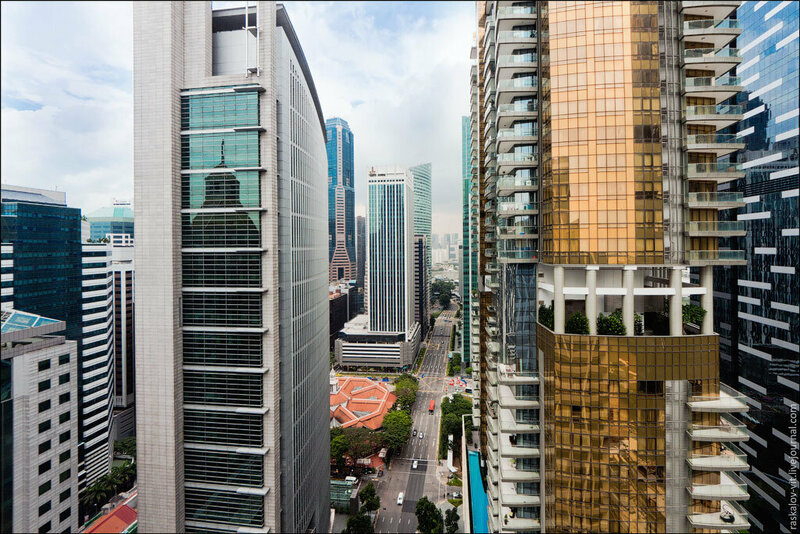 In the city there are a lot of skyscrapers taller than 100 meters and most of them are situated in one business quarter. It looks really cool. 35. 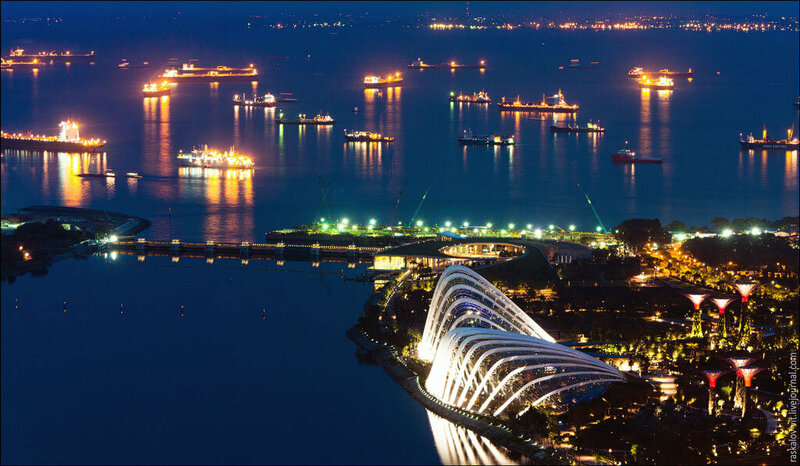 The port of Singapore is the biggest one in the world. 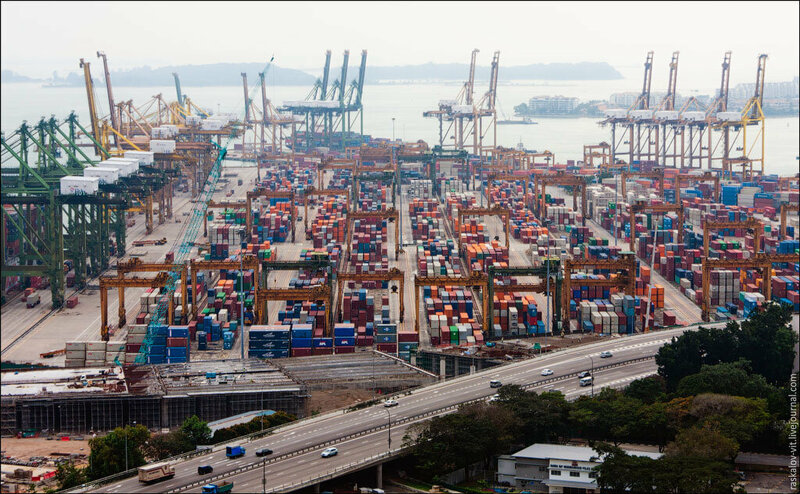 More than 28.5 million containers per year can be received by the port. 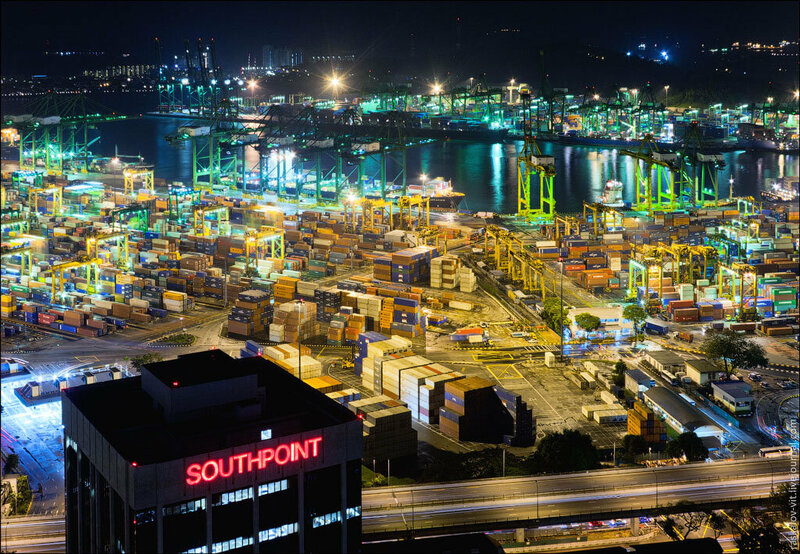 Now the port of Singapore is connected with 600 ports in 123 countries. 36. 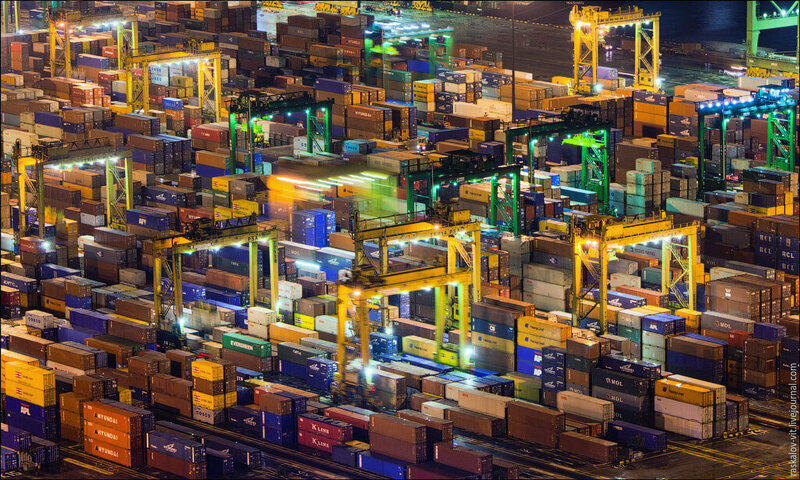 The entire port is automated, containers roll around on their own without any help.